The armoured division of the People's Liberation Army will be equipped with next-generation laser-guided missiles, in a move to improve the long-range firepower and accuracy of its tanks. The PLA Daily said on Wednesday a new glide bomb, that can be fired from tanks rather than from missile launchers, had been developed after years of live-fire tests on plateaus, islands and in the Gobi desert. It was the first formal confirmation by the Chinese army that it was developing laser-guided missiles, making it one of a select few countries - that include the United States, Russia, Ukraine and Israel - to be equipped with the controversial new weapon. "The gun-launched missile is a special bomb that combines accurate guidance technology and conventional tank gun systems to improve the hit rate of main battle tanks," Shi Yiqun, a senior engineer in an armoured unit, told the newspaper. 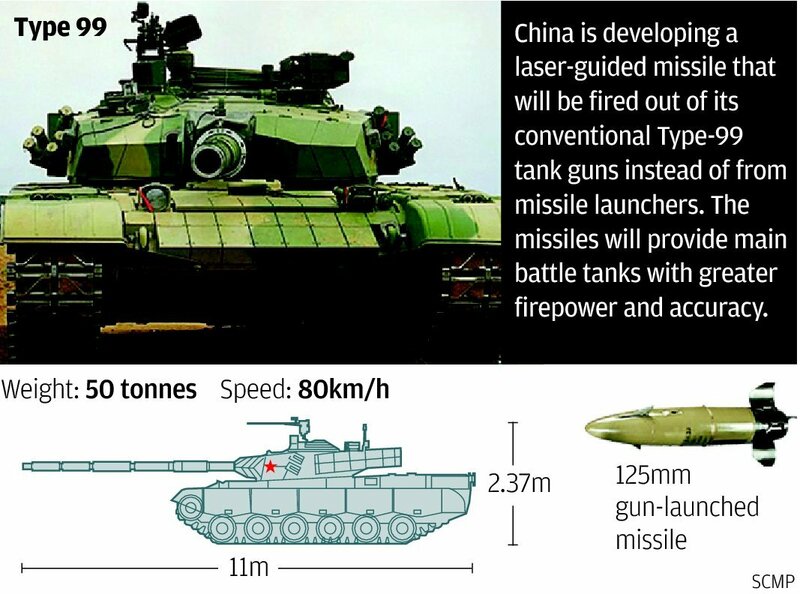 Military analysts said the new weapon would turn China's conventional Type-99 tank and other next-generation cannons into weapons of "massive destruction". "China has developed the laser-guided bomb for years. All conventional tanks will become lethal weapons as the new technology aims at making every shot hit its targets," Zhongshan University military expert David Tsui said. The military paper said the PLA had spent years developing the missile and its laser-guided and global positioning system technologies. Tanks with various calibres and gun systems will be able to use the missile. It said the new missile would not affect tanks' conventional firepower. "The laser-guided missile will not harm the traditional smooth bore gun, but make it much more powerful and accurate," Xu Guangyu , a retired PLA major general, said. A laser-guided device on the head of the missile keeps the missile on course by bouncing radiation off its target. The technology is not as effective in bad weather, or when used on targets that do not reflect laser radiation. At last year's air show in Zhuhai, Guangdong, when China unveiled the LS-6 precision-guided bomb, Western media claimed it was a copy of the KAB-500L, a laser-guided bomb developed by the former Soviet Air Force. Both are similar to US Paveways.